Many woodpeckers and sapsuckers are tree bark feeding birds with unique clinging feet, long tongues, and specialized beaks. These beaks are designed to help with communicating the possession of territory to rivals and locating and accessing sap and insects. This is done mostly by rapid drumming and pecking noisily on tree trunks with their beaks. There is a big difference between the two birds. The insect-eating woodpecker (family Picidae) has a long tongue, in many cases as long as the woodpecker itself, that can be quickly extended forward to capture insects from the inner and outer bark. Woodpeckers tend to explore decaying cavities on trees and spots that have active insect activity. Woodpeckers tend to only feed on dead or dying wood and are generally considered harmless to a tree. They do not feed on tree sap like their sap-sucking cousins, which can seriously damage trees. You can tell the difference between the birds that have been visiting your trees by the holes they leave behind. Sapsuckers have a tendency to form lots of small holes in horizontal lines. This allows for sap to flow out when they are feeding. Meanwhile, the holes left behind by woodpeckers are larger and can be found in different spots up and down a tree. The sapsucker is a serious tree pest. The most common sapsucker in North America, also the most destructive, is the American yellow-bellied sapsucker. The bird is one of four true sapsuckers in the family Sphyrapicus. 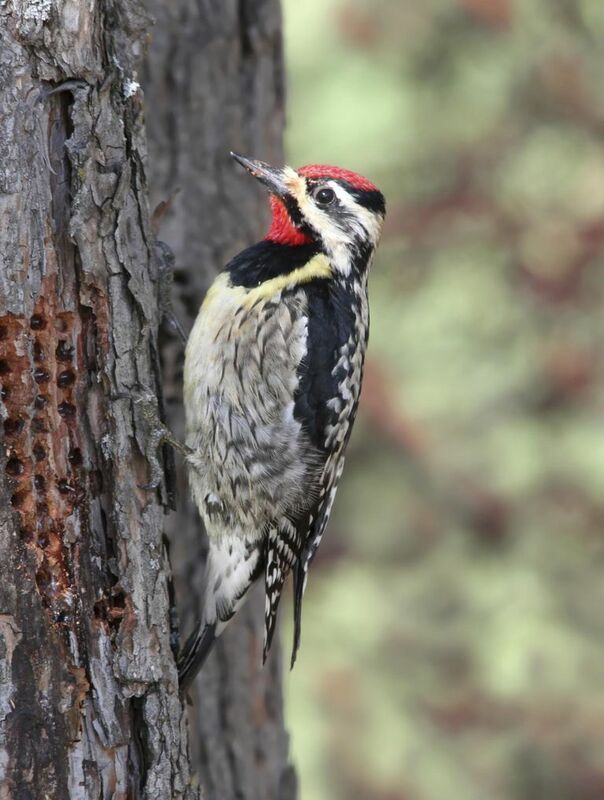 The United States Forest Service suggests that the American yellow-bellied sapsucker can attack, kill trees, and seriously degrade wood quality. Sapsuckers are migratory and can affect different tree and shrub species on a seasonal basis throughout eastern North America. It spends summers in Canada and the Northeastern United States and migrates to the southern states in the winter. Certain tree species, like birch and maple, are particularly susceptible to death after being damaged by yellow-bellied sapsuckers. Wood decay or stain fungi and bacteria may enter through the feeding holes. A USFS study concludes that when a red maple has been fed on by a sapsucker, its mortality rate goes up to 40 percent. A gray birch is even higher at 67 percent mortality rate. Hemlock and spruce trees are other food favorites but seem more impervious to sapsucker damage, the death rate is at 1 to 3 percent. A woodpecker searches the surfaces of tree trunks and branches for wood boring beetles, carpenter ants, and other insects. The pecking style they use for feeding is very different than their territorial drumming which is done mainly in the spring of the year. When looking for insects, only a few pecks at a time are made and then the bird explores the resulting hole with its specialized bill and tongue. This behavior continues until an insect is found or the bird is satisfied that one is not there. Then the woodpecker may hop a few inches away and peck at another place. The bark holes created by this feeding activity often occurs randomly as the bird explores with pecking up, down and around a tree trunk. This pecking style, for the most part, does not harm the tree but can be a problem when a bird decides to visit wood siding, wooden eaves, and window frames. Woodpeckers can become destructive to property, especially wood cabins located that are near mixed urban and woodland zones. Sapsuckers attack living wood to get at the sap inside. They often return to the tree to increase the size of the holes for more, fresh sap. Insects, especially those attracted to the sweet sap exuding from sap holes, are often captured and fed to the young during the breeding season. Repeated attacks of feeding sapsuckers can kill a tree by girdling, which occurs when a ring of bark around the trunk is severely injured. In the United States, yellow-bellied sapsuckers are listed and protected under the Migratory Bird Treaty Act. Taking, killing, or possessing this species is illegal without a permit. To discourage sapsuckers from feeding on your yard tree, wrap hardware cloth or burlap around the area of attack. To protect buildings and other outside personal property, place lightweight plastic bird-type netting over the area. Visual control using toy plastic twirlers fastened to the eaves, aluminum foil, or brightly colored plastic strips are somewhat successful in repelling birds by movement and reflection. Loud noises can also help but may be inconvenient to maintain over an extended period of time. You can also smear on a sticky repellent such as Tanglefoot Bird Repellent. Tree Guard Deer Repellent is also said to discourage feeding when sprayed on the tapped area. Remember that they may choose another nearby tree for future tapping. It may be better to sacrifice the tapped and already damaged tree in favor of the loss of another tree due to future tapping damage.